What Type of Car Owner are You? Heat is essential to any bathroom but this doesn’t mean you have to compromise on style or pay over the odds for fuel consumption. If you’re adding a radiator to a bathroom or considering alternative heat sources, check out our tips for heating your bathroom with style. Radiators are a practical addition to a room and are particularly important in a bathroom where it’s easy to become chilly as you wash, bathe or shower. When choosing, it’s important to check the size of the space to be heated and determine your heat output requirement. Heat output is measured in BTU (British Thermal Units) and manufacturers must ensure their radiators provide the level of heat advertised. Asking a plumber or heating engineer to work out the BTU for your bathroom is the most accurate way of ensuring your room is heated sufficiently; however you can work it out for yourself by using a free BTU calculator online – it will ask for key information i.e. size of the room, windows, and then calculate the minimum number of BTUs required to warm up the room. Positioning is important, too. Radiators should occupy the coldest place in a room (often just below the window), as they use convection (the flow of warm and cool air) to warm the space. 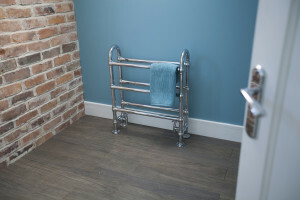 Before looking at styles, you must consider how it will be connected, most towel rails and radiators can be connected to the central heating system, provided that it has been treated with a Corrosion Inhibitor. Some radiators are electric and are not connected the heating system, this will be indicated in the radiator specification section and to fit it you must carefully follow the Heating Element Fitting Instructions and the electric connection must be installed by a qualified electrician. If you are using a product as an electrically heated towel rail only (not connected to the central heating system) the towel rail must be filled with a water/glycol mix and leave a 5% air gap and fill the remaining with 80% water and 20% glycol. If you are unsure which option works for you please speak to a plumber who will be able to help you. Heat output and positioning aside, radiators are also inevitably judged in terms of their looks. Bathroom suites come in a variety of styles both traditional and contemporary and so too do radiators and towel rails. 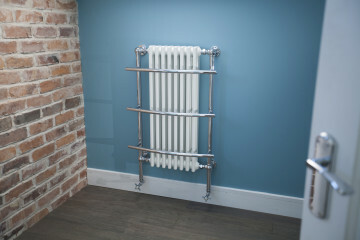 A ‘standard’ home radiator is made of compressed steel, has an undulating surface and is coated in white. It’s a ubiquitous design, well known, neutral, and no great style statement for any room. Contemporary designs tend to have perfectly flat panels or vertical poles or ‘slats’: tall, slim, sleek radiators in white, stainless steel, chrome or mirrored finishes which are simultaneously eye-catching yet unobtrusive. Stainless steel construction tends to be more durable than a chrome finish, which can degrade over time. Traditional column radiators have two or more columns (depending on heat output required and overall height and length), and are mainly made out of steel, (however some can be constructed from cast iron for which you will need strong walls), and range from plain to highly decorative. 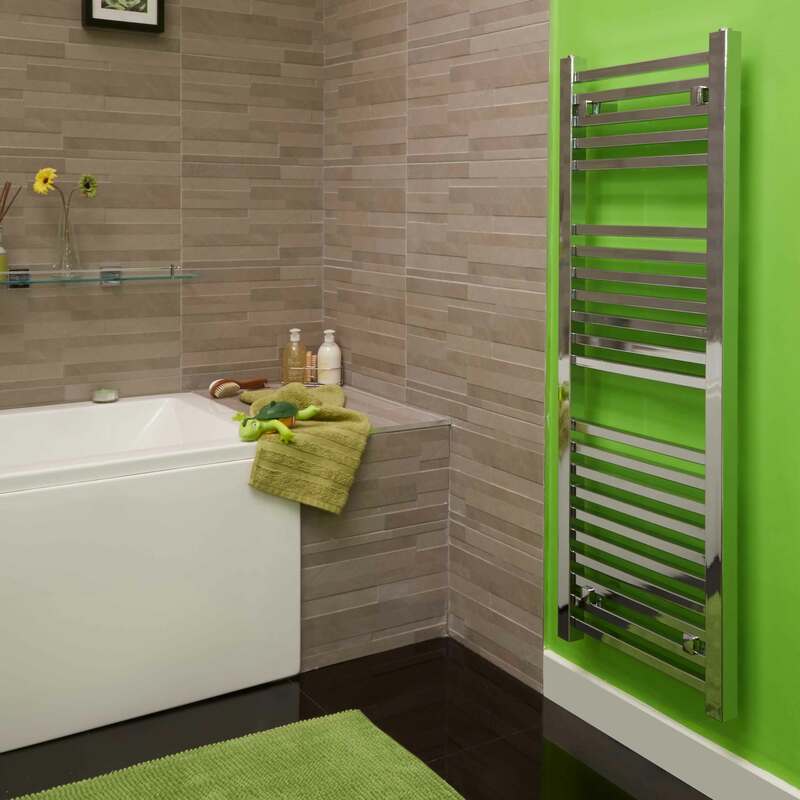 A single heated towel rail may not provide sufficient heat output, but more than one can help warm the room. Towel rails have horizontal poles or slats, to allow for the hanging of towels: contemporary styles are slim and flat to the wall while traditional designs feature small column radiators within a framework of tubes on which towels can be hung and warmed. Finally, manual and thermostatic radiator valves are available in a range of styles from unobtrusive to highly decorate to suit your chosen radiator or heated towel rail. If you are unsure always consult a plumber or bathroom specialist who will be able to help you choose the right option for your home. Could This Be the Best Ever Gift for Dad?